KLM Royal Dutch Airlines has released a new commercial, inviting you to watch what happens when people in the airport bond with each other instead of looking down to their devices. 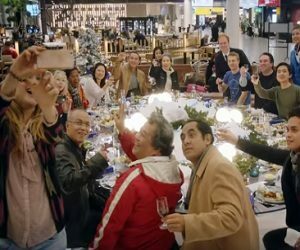 The spot, created with the idea that “the holidays are all about being together”, features a “Bonding Christmas Buffet” served at Amsterdam Airport Schiphol, where lots of people spend their transfer time alone. The airline company set out a large table in the airport, but at height, with the chairs on the floor. If you wonder how the table gets down or when, the answer is: when all the chairs are occupied. People soon realize that and if, at first, they put their hands on the chairs next to them, eventually they end up by calling people around them to come and sit down. The “reward” is a delicious feast enjoyed by various persons, both men and women, regardless of their age, race or nationality. They all laugh, have fun and take photos before embarking on their flight. The commercial ends with the tagline “Bringing people together for Christmas”.